We have always followed our Norwegian clients abroad, and it is exciting to see that after 31 years of having overseas offices, international clients and leading lawyers are now coming to us, says Managing Partner, Finn Bjørnstad. Wikborg Rein's London office employs multi-national lawyers, offering both English and Norwegian law advice in shipping, offshore, energy, banking and finance sectors. – We no longer refer to London as a "foreign office". It is now the centre of a major part of our activities where we are competing for international clients within our key industries, explains Finn. In September we moved into new offices located on Cannon Street. The new office is only a block away from our previous address but provides us with more space and the opportunity for further growth as evident with the arrival of three new partners. Last week Renaud Barbier-Emery and Jonathan Goldfarb joined us from international law firm Ince & Co, where they were both partners. A third new partner, from a leading London law firm will also be joining us in Q1 2019. This will be announced in due course. – Renaud and Jonathan both specialise in offshore energy and maritime law which continues Wikborg Rein’s policy of recruiting experienced and respected industry professionals who will further strengthen the firm’s reputation as a leading specialist in the shipping and energy sectors. I look forward to working with both, says London Managing Partner, Chris Grieveson. Renaud Barbier-Emery has long-standing experience with offshore oil and gas projects and Jonathan Goldfarb advises many of the key players in the LNG shipping and offshore sector. We also welcome Senior Lawyer Ina Lutchmiah who has also joined us from Ince & Co. She specialises in the same areas as Renaud and Jonathan, and has worked closely with them over the last ten years. Our new partners all have solid relationships with leading Norwegian and international players in the market and this will create a significant synergy with the firm's existing clients. – This will strengthen the company's already strong position as leading specialists within shipping and energy, explains Chris. First day at Wikborg Rein. 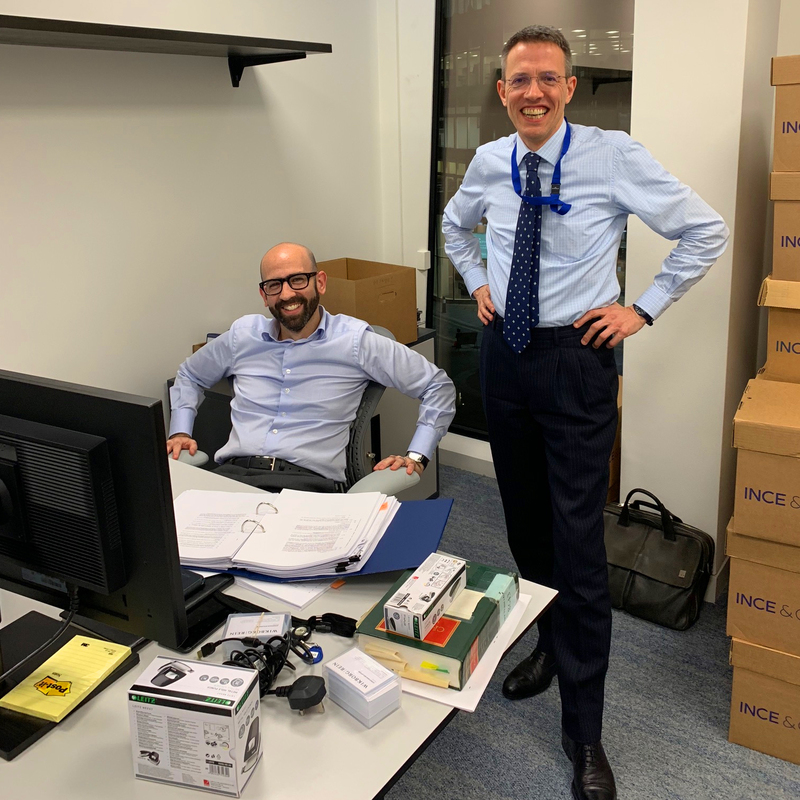 Jonathan Goldfarb and Renaud Barbier-Emery at the London office. Learn more about our new partners. Despite the uncertainty of Brexit, we continue to expand within our London office. This also applies to our corporate practice and we are currently looking for an experienced Norwegian transaction lawyer to join our London team. The position will be as part of our Norwegian M&A/ECM team led from Norway and acting as gateway to the corporate markets (ECM and M&A) in London. Many banks, founds and investors focusing on the Norwegian market are based in London. We are looking for an independent and proactive person capable to connect and be our link to such clients. The candidate should have a minimum of five years' relevant experience and the ambition to work in London for two/three years. – No matter the outcome of Brexit, London will still be an international centre for our key business areas with high activity and we will continue to grow in London. I do not think there has ever been a more exciting time to work in London – side by side with lawyers from all over the world, concludes Finn. Candidates interested in working at our London office may contact our head of M&A Ole Henrik Wille. Learn more about our new London office.